By definition, motor freight is freight that ‘consists of various types of commercial, manufacturing, governmental, or residential goods, which are moved via truck, as opposed to rail or air, to their destination, whether that be a retail outlet or to an individual customer. A large majority of us see these trucks driving down our roads and highways every day, but when do people need to use them? An average person may never use a motor freight company. Odds are, they’ll send out their packages via USPS, FedEx, UPS, etc. When packages start to become more complex, whether they are large in size (greater than 100 pounds) or delicate in nature is when you should begin considering all possible shipping options. Businesses both large and small use freight companies to send out their shipments, as well as individuals who ship large or specialized goods. 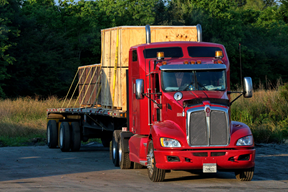 Freight companies have the proper skills and training to handle these shipments safely and effectively, ensuring that your goods reach their destination in good shape. So how can Freight Rate Central benefit you when you need to use a motor freight company? 1. We have a true, fully automated online quoting system that provides instant, reliable results when given full and accurate information. 2. Our rates are the lowest in the industry. 4. We provide 24-hour-a-day, 365-day-a-year shipment tracking, even for shipments that occupy less than a truckload. If you have a shipment and are in need of the services of a freight company, call a common carrier to get a quote. Then, contact Freight Rate Central and see how much money you’ll be able to save when you work with us.